If you're looking for more 4K contents, you have somewhere new to turn: YouTube, except from Netflix, Amazon and M-Go. Luckily enough, the considerable speed improvements with the A8/A9 processor, base-level storage increase and optical image stabilization (OIS) in iPhone 6, 6s, 7, 8 and iPhone X/XR/XS make the high-speed writing and reading operations of Ultra HD on Apple's new iPhone splendid. While you may be marveling at the resolution of 3840 x 2160 that makes image incredibly sharp on your iPhone 6 and iPhone 6s, there's still a long way to go for 4K Ultra HD streaming and a slew of people wonder to download 4K video to iPhone 6/6s from YouTube for offline enjoyment. And this guide centers on how to save YouTube 4K video to iPhone 6S/6 or later iDevices using a professional video converter for 4K. 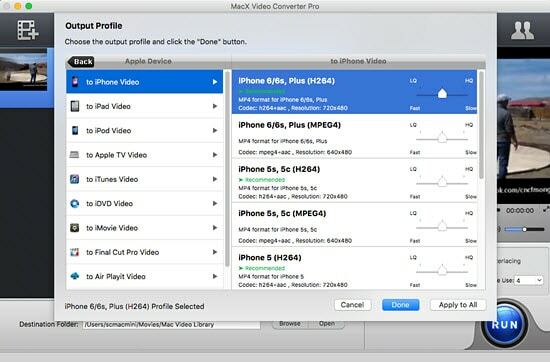 MacX Video Converter Pro, like the way it is dealing with 1080p HD videos, this 4K Ultra HD video downloader supports you to free download 4K movies videos to iPhone 6/7/8/x from YouTube, FB, Dailymotion, Metacafe, Myspace, Instagram, Myvideo, etc. over 300+ movie video sharing sites. And needless to worry about the video incompatibility issue, it offers you to download UHD movies to iPhone iOS device friendly formats (MP4, MOV, M4V), codec, resolution, Bit rate and more. Beyond that, it's also your best choice to shrink the file size of HD/UHD videos. It equips a unique compression engine which can reduce the size of 4K videos by 90% with 98% original quality reserved. So it allows iDevces uesrs, especially those 16GB iPhone 6/6S users to store more 2160P videos on the devices. This 4K to iPhone video downloader converter works perfectly on the latest macOS Mojave and earlier. For pc users, you can download the windows version. Free download this 4K UHD video downloader converter on Mac. Then run it, copy and paste the YouTube Ultra HD video URL to the type box. After you click "Download Now", the rest task will be automatically done. Since you want to transfer YouTube 3840×2160 video to iPhone 6 or iPhone 6 Plus, choose "to iPhone" under "to Apple" channel as output format. After finishing the steps above, click "RUN" button to save 4K UHD video to iPhone 6/Plus/XS/XR or others. On top of 4K video downloading, you can also apply this all-in-one UHD video converter to edit 4K video by clicking on the scissor-shaped icon, including trim, crop 2160P video, add subtitles or watermark, rotate videos, etc. 1. Bandwidth saving. A high bandwidth is the prerequisite for a successful 4K streaming on iPhone 6 (Plus)/7/8/x/XR/XS. Generally, if you have a less than 15 Mbps bandwidth, Ultra HD streaming is little more than a pipe dream. To say the least, watching a lot of videos over a 3G or 4G wireless connection can eat up your monthly bandwidth limit quickly. But once you finish the task of 4k ultra HD download from YouTube to iPhone 6 or later devices, bandwidth will never be an issue. 2. Space saving. It's known to all the more pixels there is in a video means the more file size that it takes. The recent research shows a 4k uncompressed trailer version of the famous movie The Amazing Spiderman takes an enormous 500GB of hard disk space. The best way to avoid such space occupation is to download ultra HD video from YouTube and compress 4K video to iPhone 6 (Plus) supported video format, such that the huge file can be shrunk down to a more manageable size. 4K is the hottest buzz word in the tech world, which rewrites the rulebook when it comes to image quality. It has become the common consumer friendly name for UHDTV, which presents native video at a minimum resolution of 3840×2160 pixels, offering 4 times the resolution of standard 1080p HDTVs. 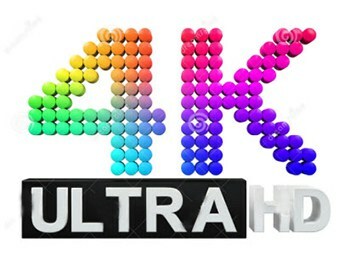 UHD 4K has a much better chance of becoming mainstream, not only because it doesn't need special glasses and some movie studios are promising a broad base of available content down the line.